The Safari Jeep Seat is a rear fold and tumble seat designed as adirect bolt-in to CJ and YJ Jeepsand will match the Corbeau Moab front seats. 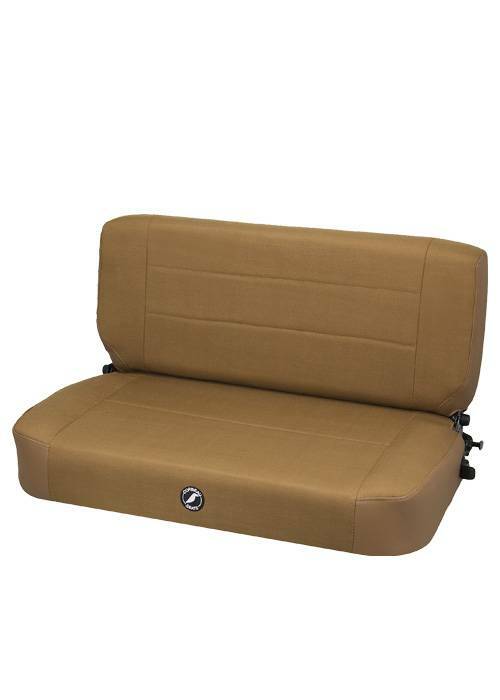 The Safari Jeep Seat is available in matching stock Jeep black, tan, spice, and charcoal fabrics.If your stock fold and tumble seat is worn out and you want to give your Jeep a new interior, the Safari is the perfect addition. If your budget doesn't allow you to get new front seats, the Safari will match your stock front Jeep seats.The Safari can also be used in other vehicles besides the Jeep. To see if it will fit, just take the dimensions and compare them to the area where you want to install the seat. The Safari Jeep Seat is available in Vinyl/Cloth Combo, and Neoprene materials.